Karnataka Congress leader Dinesh Gundu Rao also warned of stringent disciplinary action against local leaders who continue to revolt against the joint alliance's choice of candidate. 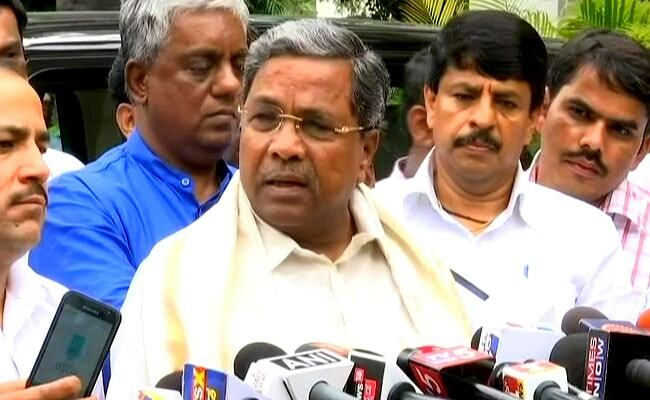 Siddaramaiah said it was necessary for both Congress and Janata Dal (Secular) workers to unite. With local Congress leaders protesting against Karnataka Chief Minister HD Kumaraswamy's son being given the coalition ticket from Mandya, state party chief Siddaramaiah today stepped in to play peacemaker. In a video released today, he is seen asking leaders and workers from both sides to work unitedly towards securing politician-actor Nikhil Gowda's victory. "Nikhil Gowda is contesting as the coalition candidate from the Mandya Lok Sabha constituency. I request both Congress leaders and workers and JD(S) leaders and workers to campaign unitedly to ensure Nikhil Gowda's victory," news agency PTI quoted the former Chief Minister as saying in the video. "Do bless him with your efforts. Deve Gowda and I will campaign together for Nikhil on April 12." Interestingly, the video was tweeted by Mr Kumaraswamy himself. "The call by the Congress-JD(S) Coalition Coordination Committee chairman Siddaramaiah to workers of both parties to face the election unitedly, and to ensure Nikhil's victory in Mandya, is timely. Let workers of both the parties work unitedly in all 28 constituencies and strive for the victory of our candidates," the accompanying caption read. Angered by the party's decision to let the Janata Dal (Secular) have Mandya, local Congress leaders have decided against campaigning for Nikhil Gowda. Many have even declared their support for independent candidate Sumalatha Ambareesh, who is contesting the polls with the BJP's backing. Sumalatha is the wife of late actor Ambareesh, who was affiliated to the Congress at the time of his death in November last year. Siddaramaiah had recently called a meeting of Mandya Congress leaders and warned of the various problems that might arise if they do not support Nikhil Gowda. He cited the case of Mysore's Congress candidate Vijayshankar, who would need the regional party's support to win. The local leaders, for their part, said it was difficult to support the Janata Dal (Secular) when they happen to be their arch rival in the district. Today, Karnataka Congress leader Dinesh Gundu Rao also warned of stringent disciplinary action against local leaders who continue to revolt against the joint alliance's choice of candidate. "If anyone goes against the party decision or does not abide by it, we will have no choice but to take action against them," PTI quoted Mr Rao as saying. "We cannot think of Mandya as separate... ours is a national party and non-cooperation is not an option."